UEFA Champions League Referees were selected on their performance level from different countries. How much money do a champions league referee get paid per match and annually. Many times controversies took place due to a wrong decision and it later highlighted by sports media. So there are new technology introduced for the matches to keep the game fair and clean. In past few years there are huge improvement take place in the decision making. Elite are the professional referees who got experienced of 5-7 years of football league careers. They have been selected for the big matches of knockout round, semi finals, round of 16 and finals. Felix Brych the German match official who is selected for the final of champions league 2017 (Real Madrid vs Juventus) earn $8,000. The elite category referees get paid ($7,000-$8,000) per match. The assistant referee’s who helps the main official during the game get paid ($2,500) per match when they were selected for the big match. In group games they get paid upto $1,000 per match. The fourth officials that get paid $1,000 when they are selected for the knockout round and final matches of champions league season. The earn $750 per match during the group games. 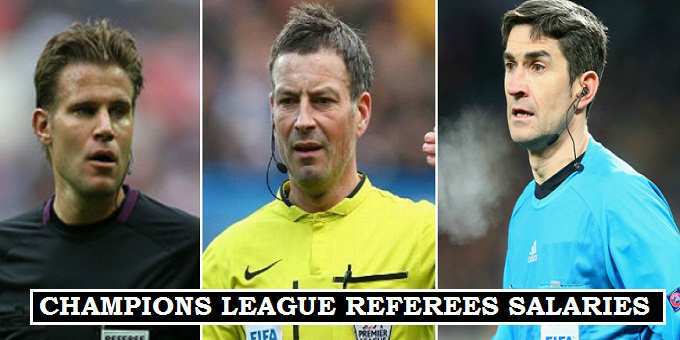 In the above table wages of the top UEFA champions league referees were mention. Details of their earnings were taken from the trusted sources and football forums.